There is no better way to declare your endless love than with the fire and brilliance of Diamonds. Masterfully crafted in highly polished 14 Karat white gold! 0.70 Carat t.w. of brilliant round cut Diamond solitaires are prong set to form five gorgeous open hearts. 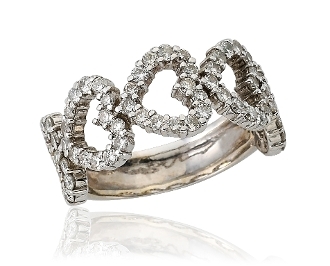 Each heart features 14 individually set Diamonds and wraps beautifully over the sides of your finger, to meet with the sleek white gold shank. The timeless design of this band makes it versatile, and can be worn as an eternity band, a right hand ring, or even a wedding band. For added appeal personalize your item, select our Engrave option and indicate size needed when adding to Cart.